My guidebooks and my reading in advance of travelling to bologna did not prepare me for seeing the Tombe dei Glossatori (The Tombs of the Glossatori) in Piazza San Domenico and Piazza Malpighi. 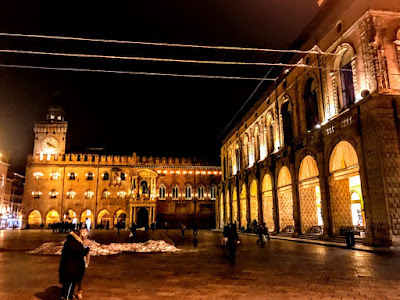 I came upon them accidentally last week while I was visiting the Basilica of San Domenico, to see the shrine of Saint Dominic, and the Synagogue on Via Mario Finzi. The tombs are named after jurists or lawyers who became known for adding glosses or notes to academic and legal documents. Although they seem to have been passed over by the writers of many English-language guidebooks on Bologna, these tombs, dating from the end of the 13th century, commemorate some of Bologna’s most famous scholars and as a group they form one of Bologna’s most unique and memorable monuments. 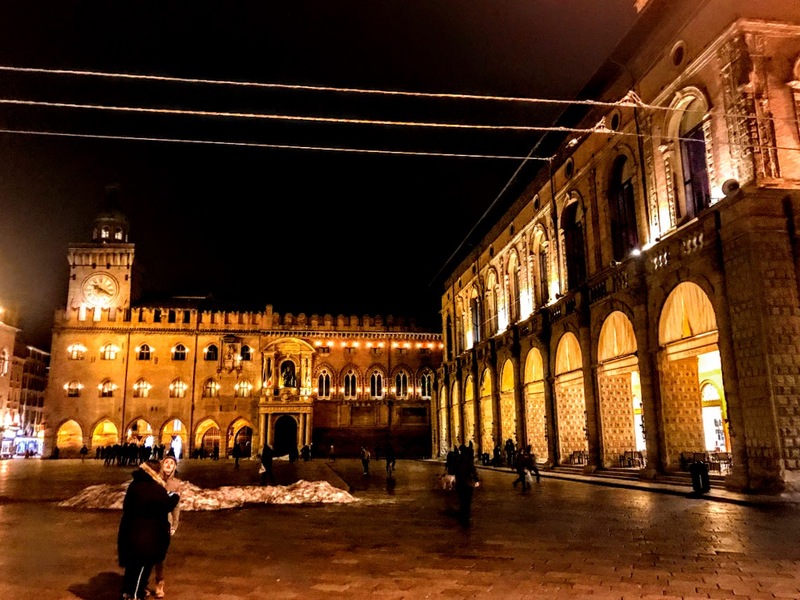 The University of Bologna was founded in 1088 by the legal scholars or glossators Irnerius and Pepo, making it the oldest university in the world. 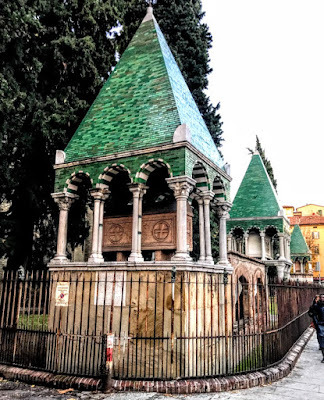 These tombs are tributes to some of the first and most important professors in the Middle Ages when the University of Bologna was renowned particularly for teaching law. They added glosses and comments on Roman texts, providing marginal explanatory additions that made the content of the passages clearer. These leading academics became cornerstones of political and cultural life in Bologna. The five tombs or mausoleums still standing today are in two squares in Bologna, Piazza Malpighi, beside Piazza San Francesco, and Piazza San Domenico. 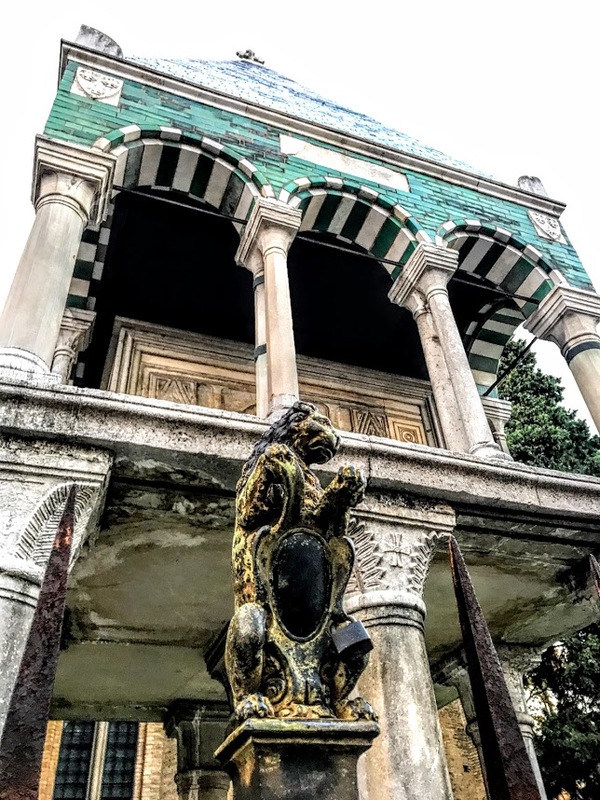 They are raised above the ground on slender marble columns, are covered in majolica tiles, with canopies of marble arches above and each is capped with a pyramidical roof. Over the centuries, many similar mausoleums have been lost, and the ones that stand today have been rebuilt, damaged, restored and reconstructed. 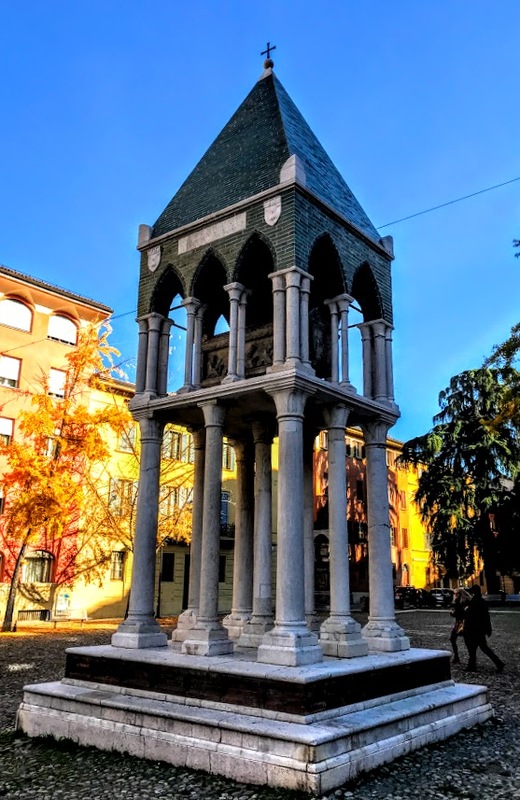 Today, are isolated from long-lost cemeteries that once surrounded them, and as a collection they form archaeological and cultural features that are unique to Bologna. His tomb was restored in 1497 and again in 1574 by his descendants, Lorenzo Odofredi and Girolamo del fu Lorenzo Odofredi. When the Chapel of Malvezzi Lombardi was built in San Francesco in 1713, Odofredo’s remains were said to be still in the tomb. Fragments from other parts of the tomb were used in the restoration of the pyramid at the top in the 19th century. The columns are of white marble from a Greek quarry, and the capitals of pyramid trunks adorned with palm leaves, similar to those in San Vitale in Ravenna, and with Byzantine influences. The interior was plastered and painted or lined with glazed bricks. In this same grouping at San Francesco are the tombs of Rolandino de ’Romanzi, who died in 1284, and of Accursio, father and son. The tomb of Rolandino de ’Romanzi was destroyed by the French Government in 1804, which claimed it served as a ‘hiding place for assassins,’ an ironic excuse for levelling the tomb of the author of De maleficiorum order, one of the first treatises on criminology. It was eventually restored in 1888. The third tomb, chronologically, is that of Accursius, which dates from 1293. This was built not for Accursius, or Accursio di Bagnolo the father, who died in 1263, but for his son Franciscus or Francesco d’Accorso, who taught at one stage in Oxford and died in Bologna in 1293. Dante places the son Francesco in Hell among sodomites (Inferno XV, 110). The father was first buried in the cemetery at San Domenico cemetery, but his body was later moved for political reasons. The materials used include Greek marble and the capitals display rich foliage with Romanesque-Byzantine style. When the tomb was being restored, it was discovered that it was originally divided into two cells, one upper and one lower. The inscription reads: Sepulchrum Accursii, glossatoris legum, et Francisci, ejus filii. The monument was erected despite intense accusations of immorality against the Accursii. The Palace of Accursio (Palazzo d’Accursio) still stands today on the Piazza Maggiore, a testimony to the family’s lasting influence despite exile and approbation. Since 1200 it has been the seat of the City Council. The two tombs at the Basilica of San Domenico commemorate Rolandino de ’Passeggeri and Egidio Foscherari. The tomb of Rolandino de ’Passeggeri is the second oldest of the five monuments, dating from 1285, while the tomb of Egidio Foscherari was probably completed by 1291. The beautiful and elegant tomb of Rolandino de ’Passaggeri was also used to bury the proconsul of the Collegium of Notaries from 1581 to 1658. Despite damage caused by a bomb in 1943 during World War II and the numerous preservation and restoration efforts, the tomb still looks essentially like the original mausoleum. Egidio Foscherari was a professor of canon law professor, and his tomb shows Byzantine and Venetian influences. The interior of the pyramid was once painted to illustrate ‘heaven sown with nimbate stars,’ an interesting influence from the Christian traditions Ravenna, rather than the depictions of Roman law used to illustrate the other tombs. 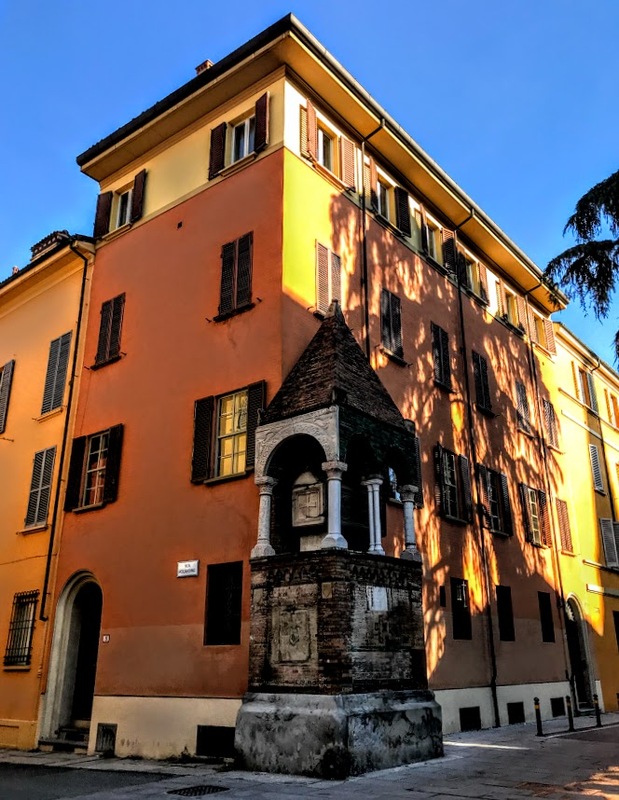 Egidio Foscherari’s tomb has survived for centuries, despite being virtually incorporated into later buildings erected at this street corner.